Elijah Alexander, is a shallow, hotshot Assistant District Attorney in New York who learns he is the last of the noble Mantamaji, a long-lost race of warrior-knights who protected humanity from evil. Lead Detective Sydney Spencer is chasing a mysterious gang that is taking out all local crime syndicates. The whip-smart, star detective knows in her gut they exist, but no one, not even her captain believes her. The rise of an ancient sorcerer posing as a popular religious leader sends them both careening into a shadow world of magic, mystery and ancient conspiracy. The fate of the world is in the balance and both must decide their destiny. How can Sydney prove the New World Knights exist when they leave no trace and how can Elijah defeat an evil that has destroyed to every Mantamaji before him? 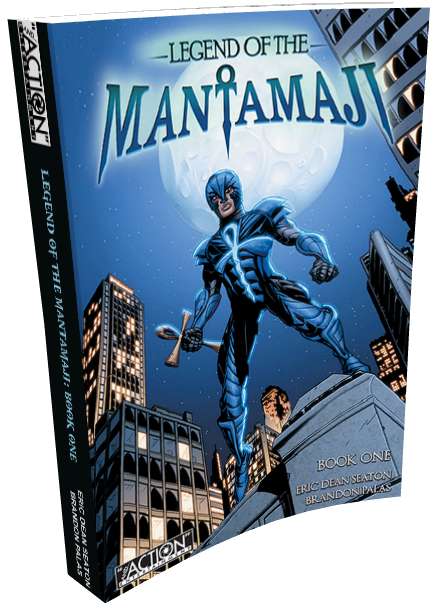 Legend of the Mantamaji is a three-book graphic novel series whose sweeping tale of magic and mystery, heroes and villains, has a fresh look, a modern setting and an ancient beat.